Exceptional customer service is a competitive differentiator. Providing consistent service that is tailored to the individual across a variety of digital channels can help organizations deliver personalized experiences that exceed the expectations of today’s digital savvy consumers. Yet, many organizations fail to deliver real-time relevance in their service experiences because critical customer data is siloed in different systems (CRM, ticketing, etc.) across the enterprise, making it difficult to understand the full customer journey and their needs at that point in time. 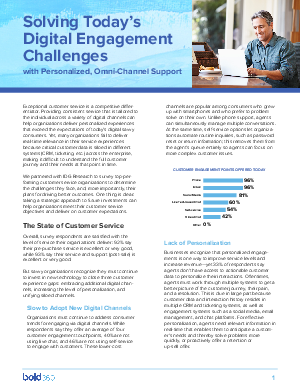 We partnered with IDG Research to survey top-performing customer service organizations to determine the challenges they face, and, more importantly, their plans for driving better outcomes. One thing is clear: taking a strategic approach to future investments can help organizations meet their customer service objectives and deliver on customer expectations.